Meets provincial/territorial OHS requirements and regulations. Designed for anyone preparing to take Confined Space Entry Training or who works in facilities with, but does not enter, confined spaces. 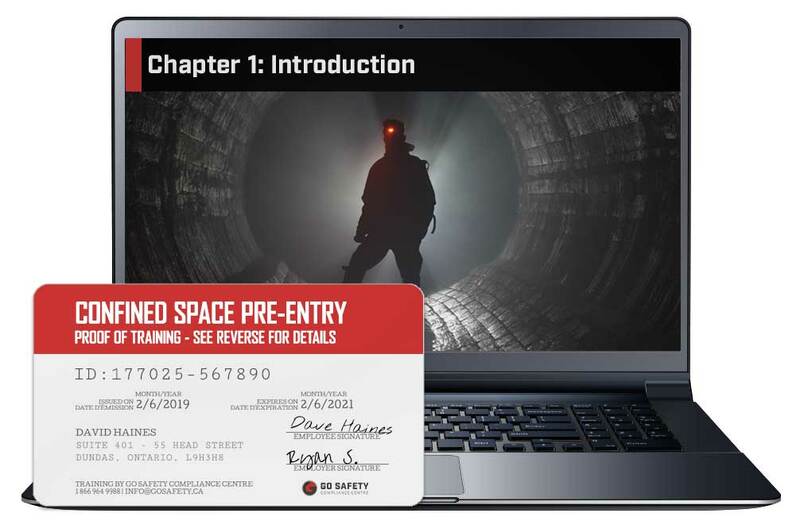 This Confined Space Pre-Entry course could be used as awareness training for employees who work in proximity to confined spaces but are not required to enter them. The course could also serve as refresher training. Additionally, our Confined Space Pre-Entry training can be partnered with practical learning components as part of a blended entry course for students requiring additional training. Krista G Verified Buyer Very informative! I enjoyed how easy but yet knowledgeable the training was. Jason M. Verified Buyer Easy to access and great for my workers on the move or out of town. Thanks. Kyle Y. Verified Buyer The course I took was affordable, quick and easy. Can't ask for much more. Daryl B. Verified Buyer Customer service is excellent, responding in a very timely manner and very informative. Able to complete everything needed quickly and efficiently. Joe C. Verified Buyer I needed certification for the next day this site literally saved my bacon. A sturdy plastic Confined Space Pre-Entry Training certificate may also be purchased directly from the My Account page. These hard-copy certificates are printed on durable 0.30mm polycarbonate plastic. Your record of training will be stored securely in your account for a minimum of three years should you need to reference it or provide proof of training. The record includes training details and completion date. WHO NEEDS TO TAKE CONFINED SPACE PRE-ENTRY TRAINING? Working in confined spaces is one of the most demanding environments an employee can face. This Confined Space Pre-Entry course is designed as an introduction to confined spaces for workers who are prepping to take the Confined Space Entry certification or who require refresher training. It is also useful for employees who work in a facility with confined spaces but who are not required to enter. WHAT TOPICS ARE COVERED IN THIS CONFINED SPACE TRAINING? Understand the roles and responsibilities related to confined space work. Differentiate between atmospheric & non-atmospheric hazards. Learn methods used to control atmospheric & non-atmospheric hazards. Become familiar with the different types of respirators used in confined spaces. Understand the need for fall protection & other forms of PPE. That depends on your job. Your employer is responsible for ensuring that you are fully trained in the safety procedures required for your employment. This may include additional practical training in air monitor use, lockout/tagout procedures, or how to maintain and store your personal protective equipment. HOW OFTEN DO I NEED TO RE-CERTIFY MY CONFINED SPACE TRAINING? According to CSA standards, a worker needs to complete the full roster of Confined Space Training every three years. This includes both theoretical and practical training. IS THIS CONFINED SPACE TRAINING VALID IN NEWFOUNDLAND & LABRADOR? [e]ffective January 1, 2013, anyone who works in a confined space in the province of Newfoundland and Labrador are required to complete a confined space entry (CSE) training course approved by WorkplaceNL. Please refer to provincial legislation NEWFOUNDLAND AND LABRADOR REGULATION 5/12: Occupational Health and Safety Regulations, 2012 XXVII, CONFINED SPACE ENTRY Section 511 through 516 for more details. HOW LONG WILL IT TAKE FOR ME TO COMPLETE THE CONFINED SPACE PRE-ENTRY COURSE? Most students complete the course in about two hours, but there is no time limit to finish your training. You can pause the program and pick up where you left off later; take as long as you need. Once completed, the training material will continue to be accessible to you for review purposes. You can write the exam multiple times until you achieve the passing grade of 80%. WILL THE ONLINE CONFINED SPACE TRAINING WORK ON MY TABLET OR SMARTPHONE? HOW CAN I ACCESS MY CONFINED SPACE PRE-ENTRY RECORD OF TRAINING? 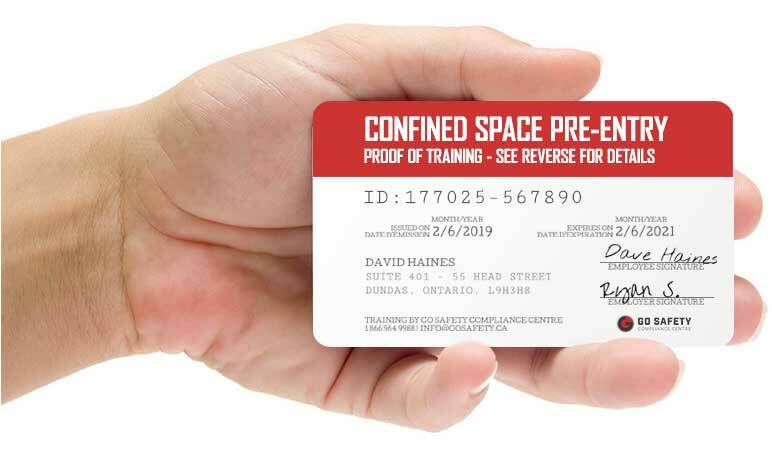 You can now purchase a wallet card version of your Confined Spaces Pre-Entry certificate online. Log into your account, go to Certifications, click then the green order button to the left of the certificate list. Select the course you would like to purchase the wallet card for and follow the prompts. WHAT HAPPENS IF I LOSE MY CONFINED SPACE PRE-ENTRY CERTIFICATE? CAN I PURCHASE CONFINED SPACE TRAINING FOR SOMEONE ELSE?